Perfect for reaching up to get items on shelves, or down to pick up something you have dropped. 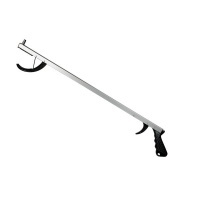 AquaTong Rust-Proof Reacher - 26 in. Pick Up Items in the Bath, Shower, Pool, etc. 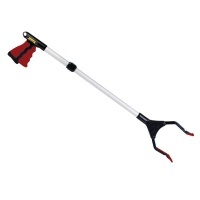 Pro Reacher - 32 in. 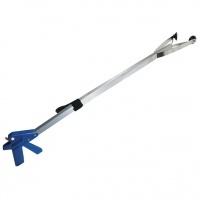 Telescopic Mini Adjustable Length Reacher 20-26in. Strong, wide jaws can lift up to 5 lbs. New to the PikStik line of reachers, the AquaTong is won't rust, so it's perfect for reaching and picking up items in the bath, shower, pool or fish tank. It's also helpful for those who work in (or enjoy hobbies related to) water gardening, aquatics and the reptile/pet field. The AquaTong is strong, rust proof and durable - perfect for picking up objects in aquariums - and its robust, wide jaws can lift up to 5 lbs. in weight. For both salt and fresh water applications, the soft replaceable tactile tips ensure ease of use and with minimal strain. Measures 27 in. long. For a multitude of uses, the PikStik AquaTong is the ideal reaching and grabbing tool to stay dry and clean whatever the job! Reachers are great for grabbing items on high shelves, picking things up and retrieving objects from hard-to-reach places without undue stretching, bending and straining. They're handy household helpers to keep in any home, and especially helpful for those with arthritis, people with neck, back or leg pain, or anyone undergoing rehab from hip and knee replacements! Extend your reach by nearly 3 feet! With the Deluxe Folding Reacher in your hand, you'll be able to pick up a variety of items that might otherwise be out of reach. Just hold it against the item you want to get, squeeze the trigger and the jaws will close around the item and hold it firmly as you bring it back towards you. This is a handy, helpful tool for any household - great for reaching up to get items on shelves, or down to pick up things you have dropped. Especially helpful for wheelchair users, those with limited mobility and anyone recovering/rehabbing from leg, back or neck injuries or surgery. Lightweight durable aluminum construction. Super suction grips. Folds in half for easy storage. Locking mechanism. Measures approx. 3 feet long. This tool is a great device for use by people who have difficulty bending or reaching, or who are confined to a wheelchair. The unique patented locking feature gives the user the ability to seize objects normally out of reach and to hold them firmly without maintaining pressure on the trigger. 30, lite weight. In a class of its own! Now the reacher preferred by professionals is available to everyone. PikStik Pro is a multi-purpose reacher designed for all uses. The patented design is strong, lightweight, safe and available in multiple sizes. Reachers are great for grabbing items on high shelves, picking things up without bending over and retrieving objects from hard-to-reach places. 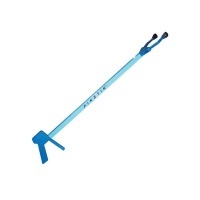 PikStik reachers let you retrieve or put away items safely without undue stretching, bending and straining. The PikStik Pro isn't just for professionals anymore! 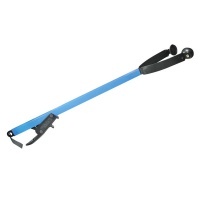 Useful for small or arthritic hands and those recovering from hip or knee surgery. 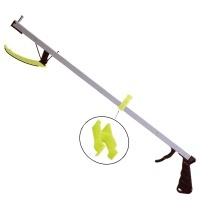 The new Rainbow Reacher is the lightest weight and has the smallest handle grip and widest jaw opening. This reacher was designed especially for pediatric and arthritic users, as well as those recovering from knee and hip surgery. The flexible rubber cups and jaw opening safely grip small and large items. The horizontal jaw opening allows the user to see the object without twisting the wrist. 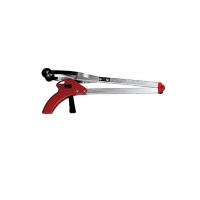 Trigger operated lightweight aluminum reacher with a Push-Pull post. Features a nonslip lower jaw for added gripping power. Rubber pad is located in the upper jaw to allow for a secure grip to most objects. Jaw design allows for maximum opening width while maintaining strength. A magnet is imbedded in the rubber tip at the front. The Reacher Clip (included) can be used to secure the reacher to the tubing of a walker or wheelchair. Introducing the World's first adjustable length reacher! The TelescoPik is the most versatile reacher ever. With a simple turn of the locking collar on the shaft, the TelescoPik adjusts from 20 in. to 26 in. - making everything within easy reach. 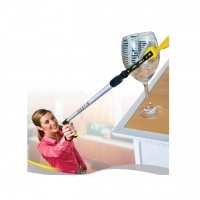 Reach out and grab the world, near or far, with the original telescoping reacher!